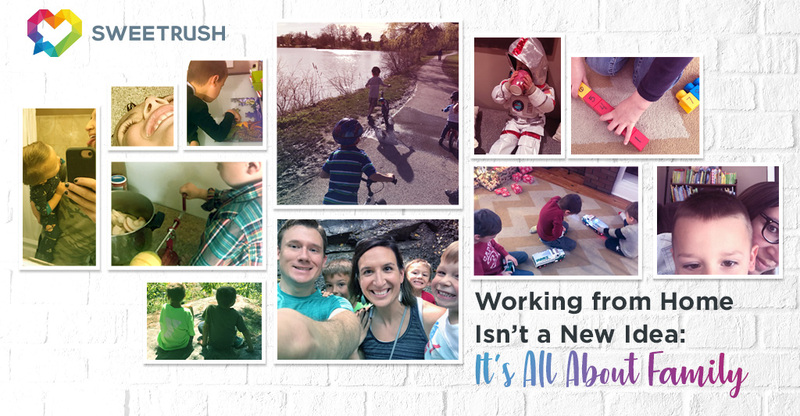 A SweetRush instructional designer discovers the benefits of working from home – and that it isn’t a new concept in the history of family life. The call seemed completely out of the blue. While it was true that a year prior I was sending my résumé out to anyone who would take it, my job search had come to a halt. I had a new baby, and I was committed to spending his first years at home, giving him my full attention. That baby boy was my everything. By the time he was a few months old, he had sleeping down to a science. Four hours during the day. Twelve hours at night. It was a new mother’s dream. Except that I was bored out of my mind. Work had always been my creative outlet. It disappeared overnight, and Pinterest crafting wasn’t doing the trick. So when the call came that asked if I was interested in a virtual position as an Instructional Designer, I leapt at the opportunity. It was at that position that I met a SweetRushian and discovered that SweetRush and I were a match made in heaven. The past five years with SweetRush have been a rush of personal accomplishments and change: two more baby boys, four cross-country moves, a year of homeschooling, and plenty of activity from three growing boys. As a matter of fact, my work with SweetRush has been one of the few things that haven’t changed. Throughout all the change, working from home has given me amazing opportunities to use my creative talents, generate income, AND remain resolved to be a stay-at-home mommy. Isn’t the technological age incredible? But what if I told you that the work-from-home approach is not unique to our millennium? I recently came across a little gem of our nation’s history that gave me a new perspective on our virtual company. Working from home isn’t a new idea at all. Working from home is what nearly all our nation’s fathers and mothers did in the beginning. Up until the Industrial Revolution, very small numbers of people worked outside of the home. At the time of the American Revolution, 75 percent of the colonists were farmers. Many others owned small shops in the front of their home. Husbands and wives worked side by side to contribute to the family economy1. It would have been nonsense to ask a colonial wife whether she planned on returning to work after having her baby. As the colonial family expanded, she continued to contribute, produce, and assign work duties to her children as they grew. Her husband worked closely with their sons to pass on his trade and his values. The entire family worked toward a common good. All that changed with the Industrial Revolution, which drastically altered the roles of fathers and mothers. Looking back, the rise of the women’s rights movement of the 1960s was all too predictable. Women wanted more than what society required of them and began again to enter the workforce. But there was a question that wasn’t answered yet: What about the kids? Before after-school programs and day care, school-aged children were responsible for their own after-school care. One 2004 study says that this latchkey generation, Generation X, “went through its all-important, formative years as one of the least parented, least nurtured generations in U.S. history.” Perhaps this is one of the greatest examples of the decline of family values in America. And I’m not sure that family values have made a resurgence. A recent report shows that only 53 percent of millennials think that their families make up “a lot” of their identity, compared with 61 percent of Gen Xers who think so. But for me, family is everything. Perhaps I can’t change the next generation’s take on family identity, but I can have an impact on three little boys. I started my parenting journey planning to value my family to the exclusion of all else. I wanted to be present for my children and to pass along my values and morals to them. But just a few months in, I was aching to have my career back. As much as I loved that baby, I had creativity and talents that he just couldn’t appreciate. For me, working from home was the perfect answer. It meant that I figured out how to snuggle a baby while working at a computer. It meant that in the span of an hour I could both kiss a boo-boo and conduct meetings with corporate executives. It meant that I could teach my child to read while growing an amazing list of clients. And I hope it will mean that at the end of this parenting journey, I will send three tightly bonded brothers into the world who have learned what it means to have integrity, work hard, stand up for what is right, and love their mother for all time. As working from home becomes practical for more professions and as more mothers and fathers spend more time balancing work and family from home, I wonder what the impact will be for the next generation. Will they identify more strongly with their family? Will they, like the sons and daughters of our nation’s parents, benefit from their parents’ examples of hard work, dedication, and creativity? I hope so. I for one am happy to be a part of this shift in our culture, and I would encourage any parent with the opportunity to work from home to seize it and enjoy it! Becky Schmidt is an Instructional Designer at SweetRush. 1 Mary P Ryan, Womanhood in America: From Colonial Times to the Present (New York: New Viewpoints, 1975),25-39. 2 Maxine L. Margolis, Mothers and Such: Views of American Women and Why They Changed (Berkeley: University of California Press, 1984) 6, 33. 3 Nancy Pearcey, Total Truth: Liberating Christianity from Its Cultural Captivity (Wheaton, IL: Crossway Books, 2004),331. Want to read more about working from home and building virtual teams? Check out these posts from our SweetRush colleagues! Nice article Becky. As a mother with a young son and a career, I absolutely understand the desire to both keep the career and be at home for your children. More companies need think differently about how to retain talented workers who can’t or don’t want to adhere to the ‘norm’ of a 9-5 job that requires s/he to be within the confines of an office. A SweetRush instructional designer discovers the benefits of working from home – and that it..